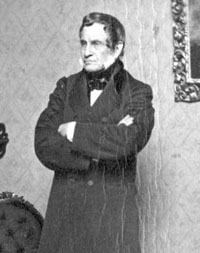 Botanist Jacob Bigelow was an early 19th century physician at Massachusetts General Hospital who, seeking to procure better medicines for his patients, became his era's leading expert on New England botany. His three-volume American Medical Botany, published 1817-20, was the most advanced such text of its time, detailing dozens of plants and their medicinal uses, and it was the first American book with printed color illustrations, most of which were drawn by Bigelow himself. He also popularized the word technology in its modern sense. Through his research and teaching, he helped define the proper use and eschewed the overuse of medicines, and warned of the dangers of narcotics. He wrote that some therapies then commonly used by the medical profession, including bloodletting and purging, not only had no effect on the natural course of diseases but could actually be detrimental, and he argued for the end of such practices. Concerned about diseases potentially spread through the common practice of human burials under and near churches, in 1831 he founded the Mount Auburn Cemetery on a sprawling, scenic site four miles outside of Boston. Bigelow and his wife are buried at the cemetery he established. 1786 according to some sources. 1787 was the date written in his family Bible's genealogy pages.